The diving center is located in Dugi Otok on the coast of an idyllic fisherman village Zaglav. The center is equipped with top scuba diving gear and two diving boats (DAN, Oxygen 50 L, First Aid Complete, Compressor 260 lit/min, GPS, Ploter, GSM, Sonar, Toilet) that accommodate 20 scuba divers. We are also equipped and certified for oxygen, nitrox and trimix. Experienced scuba diving instructors will lead you to the kingdom of Poseidon. Scuba diving activities take place in the aquatorium of Kornati National park, Telascica National park, and islands Dugi otok, Iz and Zut. 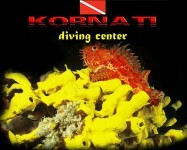 The locations are suitable for beginners as well as for the experienced scuba divers. 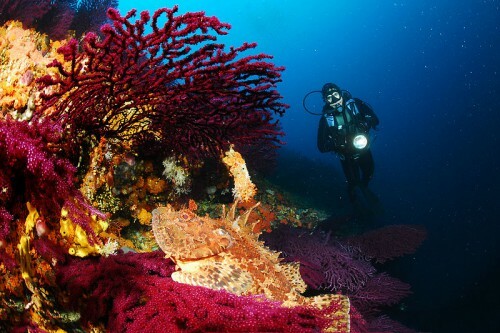 One of the favorites are full-day trips with two or three dives. On request we will organize a fish picnic in our restaurant »konoba« in the idyllic bay of Kornati National park, or take a rest in one of the beautiful bays. 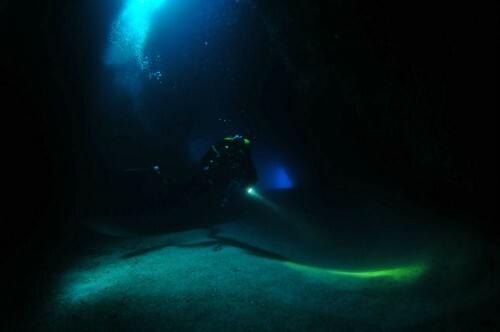 With the instructor you can dive in beautiful caves located near the island of Borovnik and Brbinscica bay.